My thanks to Diane for kindly sending me some Black Pearl erasers in June. Compared to the other black erasers we have looked at, which were all roughly block shape, the Black Pearl is distinguished by a flattened oval shape. Just for this alone, I like it. It is portable, easy to grip, and works well. It seems harder, and a bit denser, than other black erasers. Perhaps this is a manufacturing requirement for a thin eraser. Just how well does it work? I used the same Rhodia pad and Staedtler Mars pencil as in the previous review, and have added a Palomino pencil. It erases not quite as well as the Papermate Exam eraser. The softer erasers seem to have an advantage with this particular graphite/paper combination. Good info. I see those erasers at Wal-Mart all the time, but I have never tried them. For black compact erasers, I am quite content with the performance of the Uni-ball Boxy Eraser. Not appearing scuffed or dirty is a good point. Where did you find the Papermate Exam Eraser? I can’t wait to try this eraser… is it better than most erasers… and does it look all dirty after a while? 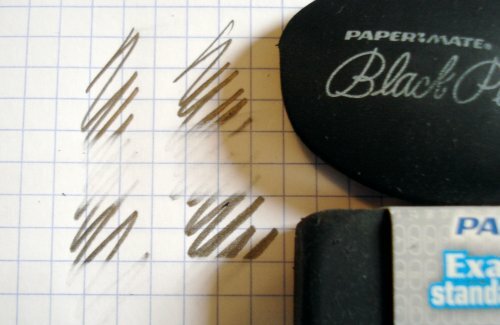 I bought the black pearl eraser and I LOVE it… it is great… and it works really well too. awesome eraser…as reflected by my insistence to come online and write on this website…buy it! Black erasers are great for use when drawing on black or dark papers (usually with pastel, color pencil, etc.). The white and pink erasers can leave a “ghost” mark where an erasure has been made, but I’ve never had this happen with a black eraser. 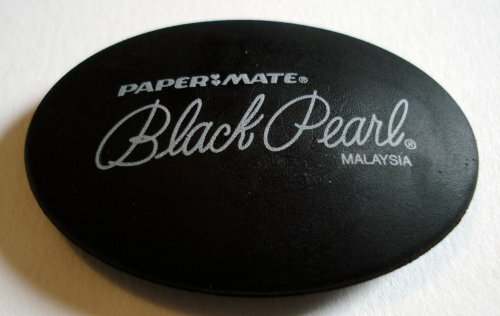 Does anyone know why some Black Pearl erasers say Malaysia, and some don’t? I don’t have any…but based on images I’ve seen. Thanks.